Learn Not to Burn® is a comprehensive fire safety curriculum for use in schools. Developed by the National Fire Protection Association, "Learn Not to Burn—Level 1" is based on the field-tested results of the original Learn Not to Burn program. It presents five fire safety messages using classroom lessons, activities and home connections. It provides you with maximum flexibility so that it can be taught as a stand-alone fire safety unit or easily integrated into language arts lessons. Throughout the program, you can invite the local fire department into the classroom to support the lessons. Contact us to obtain printed, spiral bound copies of the English Level 1 curriculum for your child care centre or school. They can also be downloaded by clicking on the images below. 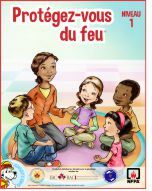 Below are the Canadian Level 1 Curriculums in English and French.